In this issue: Upcoming Corn & Soybean Auctions, New Price Reports for Members, and Mercaris is Hiring! Organic Corn Available in September! Organic corn supplies are tight! On July 15 & 16, we will be hosting an auction for 5,400 bushels of 2014 crop year, feed-grade, organic corn. This corn will be available for delivery the second half of September! Bids are FOB Maryland. 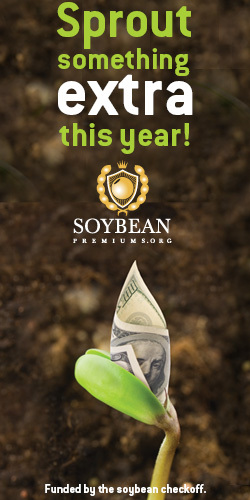 Non-GMO Soybeans for November through January Delivery! On July 29 & 30, we will be hosting two forward contract auctions for 11,900 total bushels of 2014 crop year, feed-grade, non-GMO soybeans. Bids are FOB Maryland. These are both great opportunities to connect with quality operations looking to market their grain using the Mercaris market platform. Please contact us for more information and to register to participate, by email or by phone at (301) 960-0413. 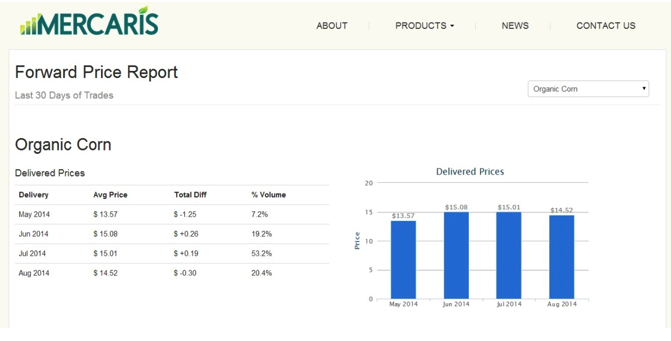 With corn and soybean crops planted and summer underway, we’re rolling out new price reports for our Members. Our market data comes from first handlers across the U.S. We’re excited to announce that we are able to post prices for a selection of forward delivery months. Below is a snapshot of national organic feed corn prices (delivered) through August 2014. The forward price curve below captures rising feed corn prices that began earlier this year and continue through the summer. Mercaris offers a similar report for organic soybeans. Since food-grade beans tend to be contracted further out, the soybean price curve extends out to February 2015. We hope these reports serve as useful market intelligence. To help you interpret them, a bit of detail on how they are generated. First, they are not forecasts; they are based on market participants who are part of the Mercaris data survey that signed forward contracts for delivery of grain. The reports show the value of those contracts per bushel, on average. Of course, we have to wait and see what the organic corn cash market settles at in August! For now, we can observe a trend of rising corn prices over the next three months based on forward contracts signed in the last 30 days. Stay tuned for next month’s newsletter: our survey has been running for a full year and we’ll have a fascinating analysis on just how good forward prices were at predicting the cash market ahead of time. Mercaris is hiring! Join us and help build something great by helping to grow sustainable agriculture through better markets. Listed below are our open positions. Please visit our website for more information. Check out Mercaris, and one of our subscribers/partners in a recent interview with Capitol Press.